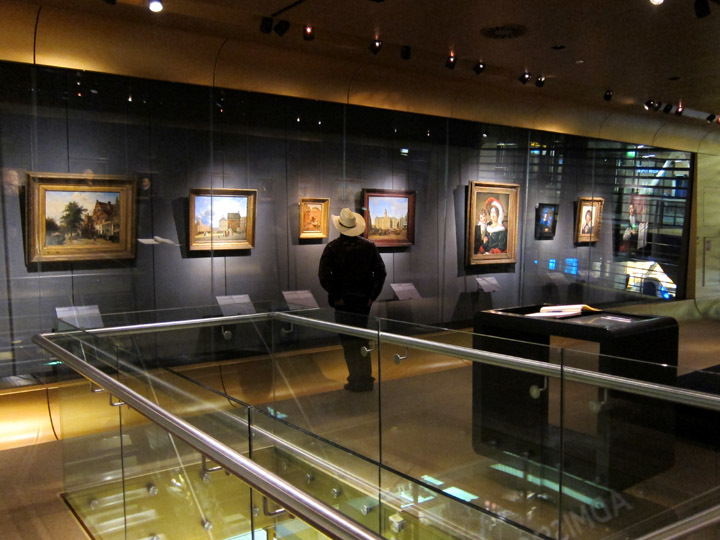 The Rijksmuseum Schiphol Airport is located inside security between Departure Areas 2 and 3. This stretch is known as “Holland Boulevard” and is cheerfully decorated with tulips, bicycle motifs, and blue and white Delft pottery designs. 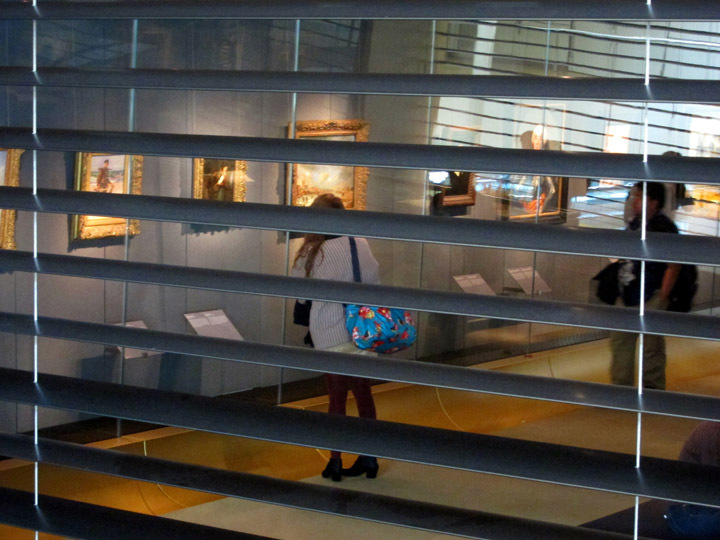 This small museum opened in 2002 and gives visitors to Amsterdam and transit passengers a chance to see a little more fantastic Dutch art before heading on their way. The small gallery run by the Rijksmuseum has been so well constructed you don’t realize you are in an airport. Visitors take a set of stairs (or an elevator) up to the second floor space placing you well above the noise of rolling luggage. Shaded windows and the low light on the artwork creates a cozy, intimate environment canceling out the chaos of this major international airport. 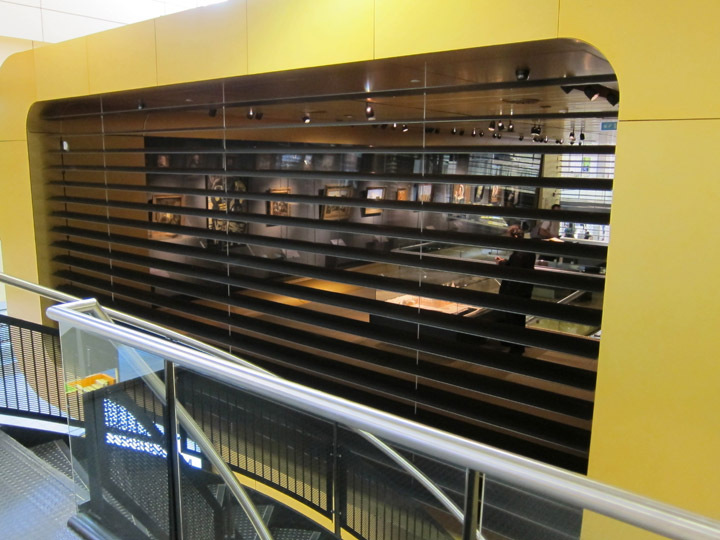 The enclosed gallery space on the second level. There is only enough wall space for about 20 pieces, but the selection and curation of the paintings are impeccable. 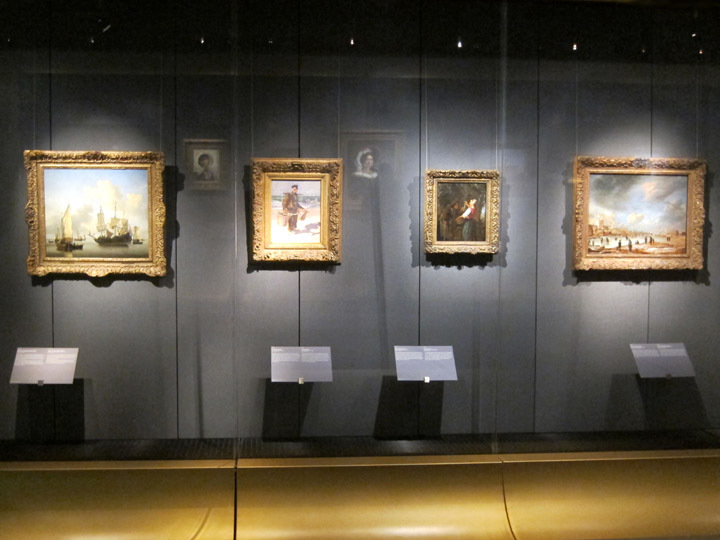 When I visited, the theme of the current exhibit was “Dutch People, Dutch Landscapes”. Portraits of people from all social classes and a variety of time periods contrasted interestingly with each other. An young man of the Enlightenment with his mechanical model hung beside a 19th century mother and child. A dark, plain portrait of a religious man was placed next to a noble gentleman in gleaming armor decorated with military honors. The landscapes on display were beautiful and classically Dutch in their detail and liveliness. They included port scenes, countryside vistas, and locals gathered around quaint urban houses. It was a very strong and diverse collection which worked perfectly in the small gallery. There is also a Rijksmuseum Shop underneath the airport gallery just in case you forgot to pick up enough souvenirs and gifts. 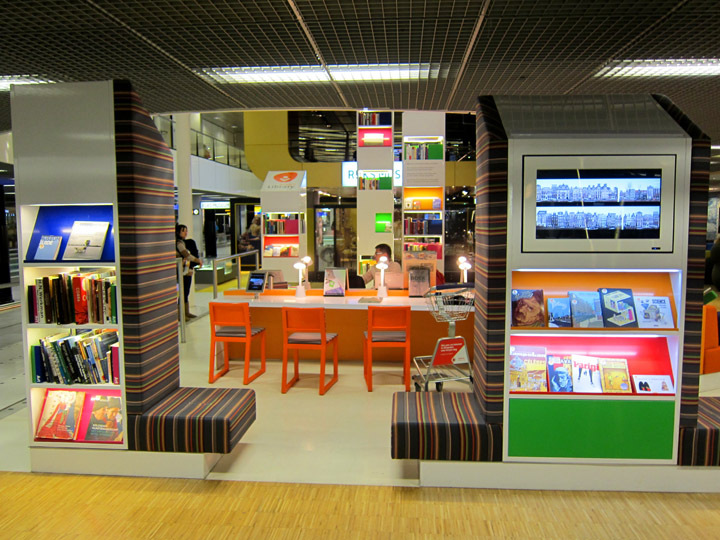 Right next to the mini Rijksmuseum is a permanent Airport Library. Here you can find a large collection of art books which are great to page through regardless of the language in which they are printed. 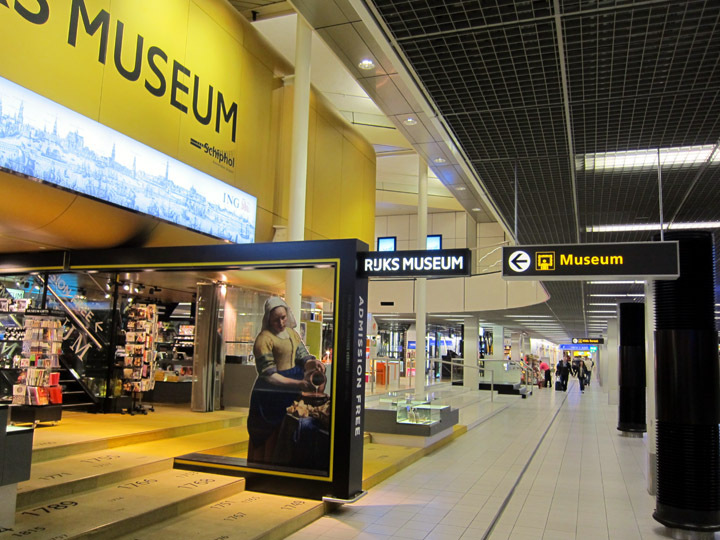 The mini Rijksmuseum at Schiphol Amsterdam airport is free and open from 7:00 – 20:00. Given that, it looks like you have your next lay-over covered! I completely agree. I was laid over here for 10 hours once (argh), and I couldn’t believe my luck in finding Dutch Masters! Great post. Thanks! I see a lot of long layovers in Amsterdam if you are coming from North America too. My last layover was 13hrs which was enough time to see the real Rijksmuseum (then nap in the KLM Lounge!) and still have time for the mini-museum. It is so wonderful to see art in an airport. More places should do this! I’ve never heard of this! Amsterdam is usually my destination, so I never explored the airport beyond what I absolutely had to, but good to know for future reference.